There are some who say that like ancient Rome, Sheffield was built on seven hills. Whatever the truth of that claim, none of the seven hills of Rome has anything like the Park Hill estate surmounting its brow. Looming over the eastern side of the city’s ring road, Park Hill is as dour as a Norman castle on its motte, a seeming fortress intended to repel and eventually defeat all incomers. No doubt there are architecture buffs whose spirits soar when they first see the Brutalist blocks but to the neutral observer it looks the opposite of, let’s say, welcoming or user-friendly. 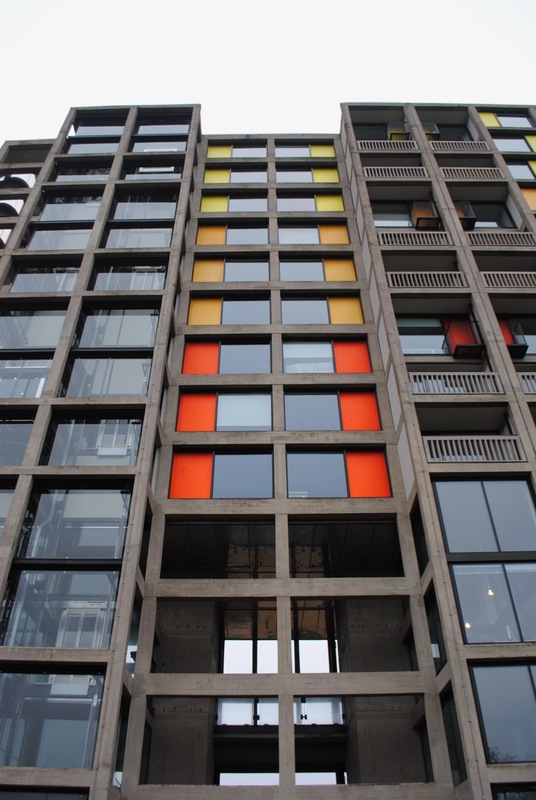 Sixty years after it was built, the story of Park Hill is an archetypal one, perhaps the archetypal one of its kind. That story, of post-war planning, of slum demolition, of municipal estates that became slums in their turn, has been played out all over Britain, but Sheffield is one of its origin cities. Park Hill was designed by Sheffield City Council architects Ivor Smith and Jack Lynn, a pair of twenty-something idealists who had already made the pilgrimage to Le Corbusier’s Cité radieuse in Marseille, a necessary stop on the Grand Tour for post-war planners and architects. The (almost) one thousand flats replaced the 800 houses and 63 prefabs that had occupied the site up until the mid-1950s, a collection of ‘notoriously crime-ridden slums’, according to John Grindrod in his book Concretopia, and known locally as “little Chicago’. For all the crime, the architects were aware, as Jack Lynn wrote, that the area had ‘fostered a community life’ that was ‘essentially healthy’. One of Smith and Lynn’s biggest concerns was how to maintain, or rather, transplant that community life. They came up with the idea of ‘streets in the sky’, an attempt to replicate the public spaces and social interactions of the old terraced streets. Park Hill was designed as a set of four interconnected blocks, such that the inhabitants could walk the ‘streets’ from one end to the other, meeting and mingling along the way. There were shops, pubs and a launderette included in the scheme. Sheffield City Council was so proud of its housing projects, especially this one, that it published a book about them in English, France and Russian versions — yes. Russian. Imagine having the corporate chutzpah to think you could teach the Soviet Union a thing or two about Brutalist housing blocks. Park Hill, it seemed, was the future, or at least one possible future. Amid all the plaudits, one dissenting voice was that of Nikolaus Pevsner, who wrote in 1967 that ‘there can alas be no doubt that such a vast scheme of closely-set high blocks of flats will be a slum in half a century or less,’ albeit ‘a cosy slum’. But in 1969, a Times journalist was far more positive: ‘Today, eight years after the flats were opened, it is obvious that the idea has worked. It has helped create a community that is close enough to the centre to be a part of the city’s life yet at the same time can support a flourishing parade of shops, a couple of public houses, a lively tenants’ association and a wide range of social activities’. Things went downhill quickly, quicker even than Pevsner foresaw. 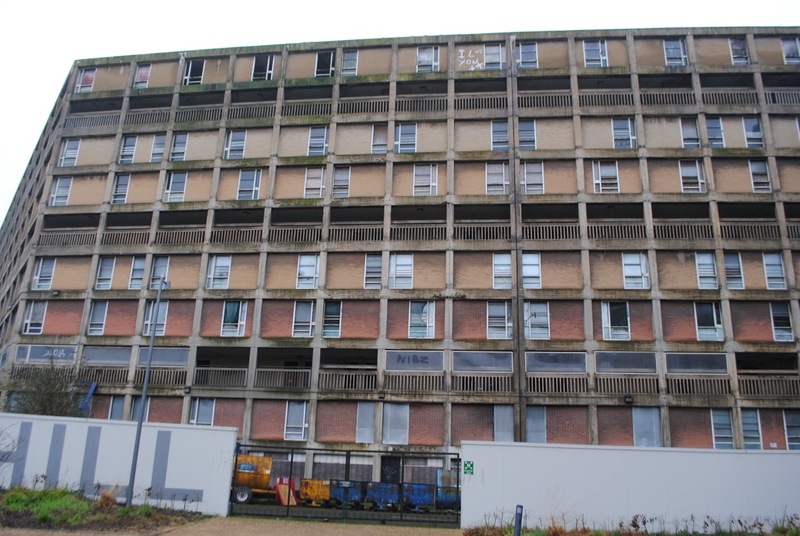 By 1980 the Times was revising its previous position, reporting that Park Hill was one of the estates ‘now identified in official jargon as “areas of worst deprivation”, whose environment is “bleak, dreary and hostile”’. The Park Hill district was a crime-ridden slum once again. It was not the only council estate to suffer social breakdown and those that did covered all architectural styles, but there is something especially ironic about the problems of Brutalist housing developments, given the claims that were made by its proselytizers. If Reyner Banham saw Brutalism as a ‘moral crusade’, Alison and Robert Smithson, architects of the (currrently-being-demolished) Robin Hood Gardens estate in Poplar, characterised that particular horror show as ‘a demonstration of a more enjoyable way of living’. You have to wonder exactly what they meant by that. If only councils in the Sixties and Seventies had introduced a contractual requirement that any architect who designed a large housing estate had to live in it for five years after completion — with their kids. It’s no great surprise to learn that the Smithsons themselves resided in a Victorian house in Chelsea. In 2004 Sheffield City Council and English Heritage turned to hipster developers Urban Splash, transferring the whole estate to them for renovation and regeneration, a contract that has inevitably meant that the larger proportion of the flats, two-thirds in fact, will be privately sold once finished (the other third will remain as social housing) . Just as inevitably, the project has drawn fire from those who cling to the ideals of both socialized housing and Brutalism. The architectural writer Owen Hatherley straddles both camps, claiming that what’s happening at Park Hill is nothing more or less than ‘class cleansing’. Hatherley doesn’t explain how the city council could have mustered the capital (or the necessary post-renovation revenue for that matter; Brutalism is nothing if not high-maintenance) or why a private developer would take on a project of this scale without being able to turn a profit. But he continues to testify to the old faith: ’Brutalism was never just an architectural style. It was a political aesthetic, an attitude, a weapon – dedicated to the precept that nothing was too good for ordinary people’. The problem with that of course is that ‘ordinary people’, given the choice, usually want a nice house with a garden and not an experiment in ‘a more enjoyable way of living’. It’s now fourteen years since Urban Splash took over and there is currently no end in sight to the project. A lot has happened in the world since then, including the banking crash of 2008, which can’t have helped with the financing. Many wags have already pointed out that the renovation is taking far, far longer than the original build. When I visited Park Hill a few months back it was quiet, sedate even. It felt, and I’m sure this can’t be true, as if few people were actually living there. Certainly a large part of the estate was boarded off. I wanted to walk one of the streets in the sky but they were protected by security systems. I wandered about, took some photographs and didn’t see another soul. 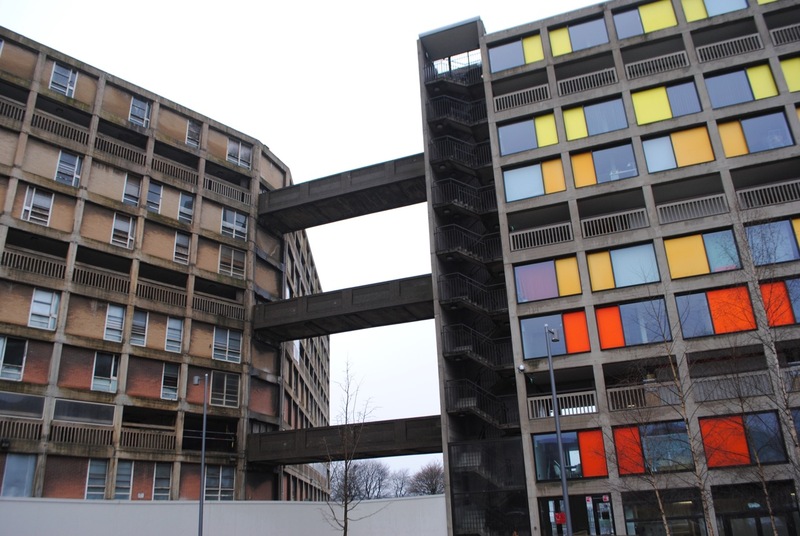 I hope the project succeeds; whatever one feels about the original ideal of Park Hill, Sheffield, like everywhere else, needs more decent housing, whether social or private. One of the Urban Splash executives once quoted a long-term resident as saying, ‘People think we live in a slum. They don’t realise that I live in a penthouse looking out over the city’. The story goes that the writer Guy de Maupassant had his lunch in the Eiffel Tower every day because it was the only place in Paris from which he didn’t have to look at it. Perhaps one of the legacies of modernism is the notion that its buildings are more pleasant to look out from than to look at.